Although it may not be the most exciting aspect of boating, maintenance plays a vital role in ensuring the longevity of your watercraft. If you’re an avid angler, you know that after a summer of use, your boat can come out of the water looking grimy. Having a dirty watercraft is problematic, not only because dirt and grime are unattractive, but also because having an unwashed boat can contaminate other bodies of water with invasive species. Keeping your boat ship shape isn’t too tough when you have the right materials. In this article, we’ll walk you through some of the essentials. If you’re a new boat owner, the first thing you should know is that you’ll need a different cleaning supplies list for your watercraft than your home. There are a few essential items that can keep your boat in great condition, inside and out. 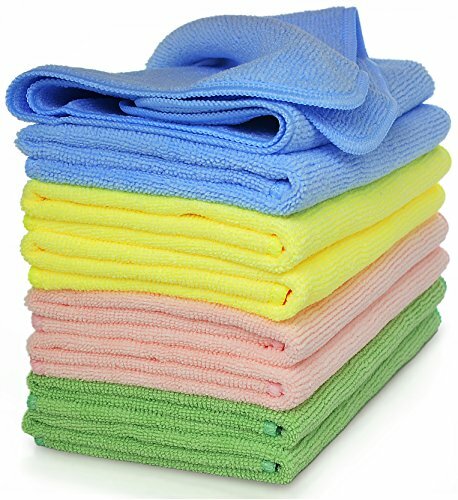 Microfiber Clothes: Rather than toting a roll of paper towels around, consider purchasing a couple of microfiber cloths. They produce less waste as they can be washed and reused, they’re gentle enough to use on windows and other scratch-prone surfaces, and they’re durable enough to clean up mess after mess. 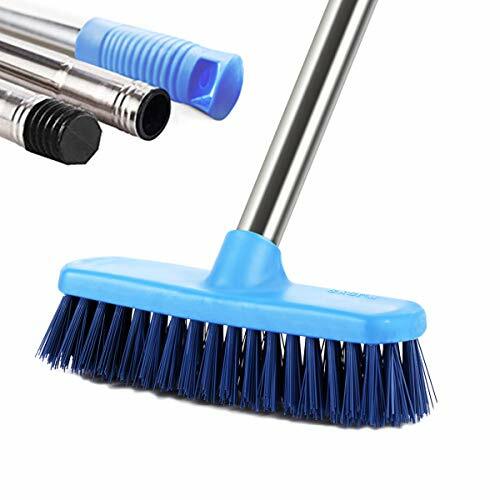 Scrub Brushes: Because angling can result in a slimy, slippery boat deck, having a tough scrub brush is essential to remove built-up grime. Restoration Kits: In an outdoor setting, your watercraft’s shine can fade fast due to harsh weather conditions. A restoration kit is helpful in reviving your boat to its original form. Vacuum: Although you may not think of a vacuum as an essential boat cleaning item, having a small, handheld vac on hand can be a lifesaver for removing dirt and debris from the interior of your boat. MEIBEI Floor Scrub Brush with Long Handle-47.3"
Now that we’ve identified some of the essential products that should be on your cleaning list, there are some brands that stick out over others. We’ve compiled a list of some of the must-haves. ​For cleaning the exterior and interior of your watercraft, these VibraWipe microfiber cloths are a great replacement for wasteful paper towels or rough rags. They are made of 80 percent polyester and 20 percent polyamide and come in packs of eight. The cloths are safe for all hard surfaces, including the exterior of your boat, dashboard, windows, etc. There is no need to use chemical cleaners in conjunction with these cloths, just water. They can hold up to 5-6 times their weight in liquid. The cloths can be washed and air-dried or may be thrown in a dryer. They have an enhanced overlocked stitch hem to prevent unraveling in the washing machine or dryer. Simple and gentle, these microfiber cloths are a great way to keep your boat tidy, inside and out. They’re thick and absorbent, and easily pick up liquid spills. These are an attractive option for a boat owner because they don’t require any additional cleaner for effectiveness; they can be used dry or with a little bit of water. The main downside of these cloths is their size. They run a little bit small, so you may need to use one or two to cover a large section of your watercraft. ​When you have a mess in the interior of your boat, the nooks and crannies of the structure can make it hard to clean. The Dyson handheld vacuum cleaner has all the power of a regular vacuum, but in a cord-free, portable package. It’s battery-powered and can last for up to thirty minutes. 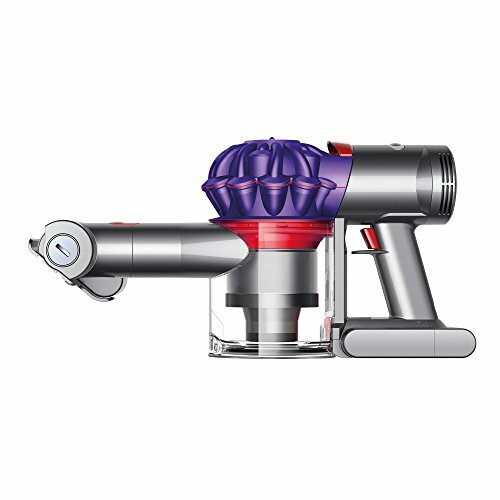 The motor is a Dyson digital V7, which Dyson claims makes this device “the most powerful handheld vacuum.” It also features several add-ons to reduce frustration when cleaning cramped spaces including a mini motorized tool, an extension hose, and a combination tool. With all the power of a standard size vacuum, this Dyson handheld vac is a real winner for cleaning small spaces, like the interior of your watercraft. It’s under four pounds, so it’s not a huge burden to carry from land to boat and the well-designed frame makes it easily storable. Ensure that this vacuum is fully charged before you use it, however, because many users complain that the device is slow to recharge and that high-power drains the battery quicker than advertised. ​The MEIBEI scrub brush is a durable, heavy-duty tool made for cleaning up tough messes (like a slimy boat deck). It can be used dry or wet, depending on your cleaning needs. It’s created using Polypropylene fibers, which can remove grit and grime from hard surfaces. The handle is adjustable and the length can be adjusted between 31-47 inches, depending on the job you’re completing. If you’re scrubbing the outside of your boat, a longer length is helpful and the shorter length works well for the inside. It’s fairly lightweight, at a little less than one pound, and is designed ergonomically in hopes of reducing user’s back and knee pain. To scrub off slimy decks or the underside of your boat, this brush is a great option to get the job done thoroughly. The durability of the bristles is praise-worthy, as they successfully remove grit and grime with ease. The adjustable sizing is also an added benefit for users with back issues who have a hard time bending; however, some users do say that the extenders weaken the structure of the brush. ​The sun can be extremely damaging to a boat that is consistently outdoors in direct sunlight. This Aerospace protectant was created to combat harmful UV rays that can fade and crack your boat’s detailing. It features a UV blocker, which can prevent premature aging through the form of fading and cracking. It comes in a liquid form, which can be sprayed onto the external surface and wiped dry with a microfiber cloth or paper towel. It can be used on several materials found in a boat including plexiglass, vinyl, carbon fiber, rubber, and more. 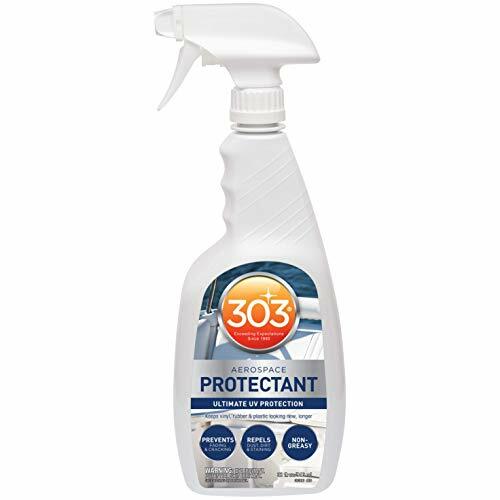 303 Products also claims the spray has restorative qualities, which can enhance lost color and luster. This is a great product to consider purchasing to keep your watercraft in tip-top shape. Because UV rays can result in so much damage and your boat is, most likely, going to spend most of its time outside, it’s important to invest in protection. Before using, make sure you read the directions carefully-- using too much of the product or removing it incorrectly can result in streaky or slippery surfaces. 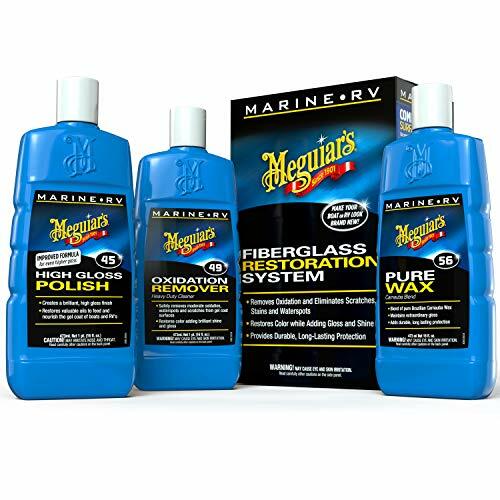 The Meguiar’s fiberglass restoration system comes with three separate products designed to restore and revive your boat. The three-step process includes an oxidation remover, a polish, and a wax. The oxidation remover works to remove water spots and oxidation while buffing out scratches. It’s also advertised to restore color and shine. The high gloss polish is used afterward to seal in a glossy finish. Finally, the pure wax adds durability and protection to the coating. The three 16-ounce bottles in combination are made to restore lost color, as well as protect from minor damage from future use. Though it may be time-consuming, restoring your boat with the Meguiar’s three-step system will yield a shinier, glossier finish. Depending on how large your watercraft is, considering buying an extra restoration kit, considering it takes a substantial amount of product to do the job properly. This kit wins points for reducing scratches and scuffs and keeping a boat’s luster for long periods of time. ​Another well-known restoration product, this Poli Glow kit includes four items used to make a watercraft shimmer and shine in and out of the water. It features a product called Poli Prep, which is used first to remove stains, oxidation, and leftover wax. Poli Glow, the boat polish, is applied next. Poli Glow buffs and shines, adding a glossy look to your watercraft while restoring color and prevent UV ray damage. The kit also features two applicators, a microfiber mitt and a handled scrub pad. These products are advertised as lasting up to 12 months, and can’t be removed with soap and water. 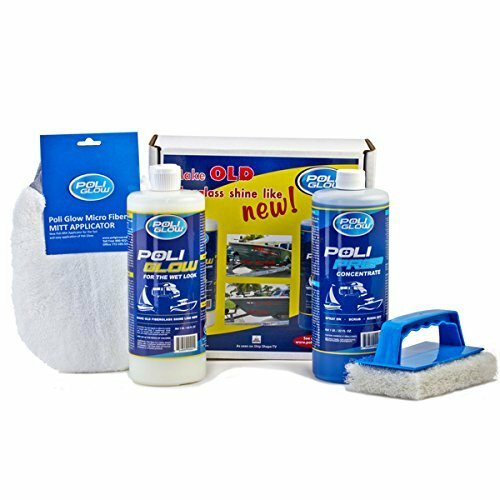 The Poli Glow restoration kit is another great option for getting your boat’s original shine back. It’s easy to apply, but make sure that you’re certain about using the product because it is very difficult to remove without the use of a stripper. The added bonus of applicators and a UV inhibitor makes this product hard to beat. Cleaning your boat is a necessary process to increase the longevity of the watercraft, as well as preventing invasive species. Rinse off your boat using a hose with clean water to remove any residual dirt, grime, and algae. Always start at the top and slowly move to the bottom, making sure you’re thorough. If your boat is in need of a deeper clean, you can use a boat-safe soap in conjunction with a scrubber to remove stubborn grime. At least once a year, finish with a restoration kit to add shine and luster to your watercraft. The following video demonstrates the importance of removing aquatic species’ from your boat before moving to another body of water. Failing to do this can result in contaminating other waterways with invasive species. Hopefully, this article gave you some ideas about some products that are essential to cleaning a boat, and a couple of great brands to start with. Though it’s may not be an exciting task, cleaning your watercraft is essential. Keep your boat in great condition while keeping other waterways safe from invasive species by practicing regular cleaning habits.